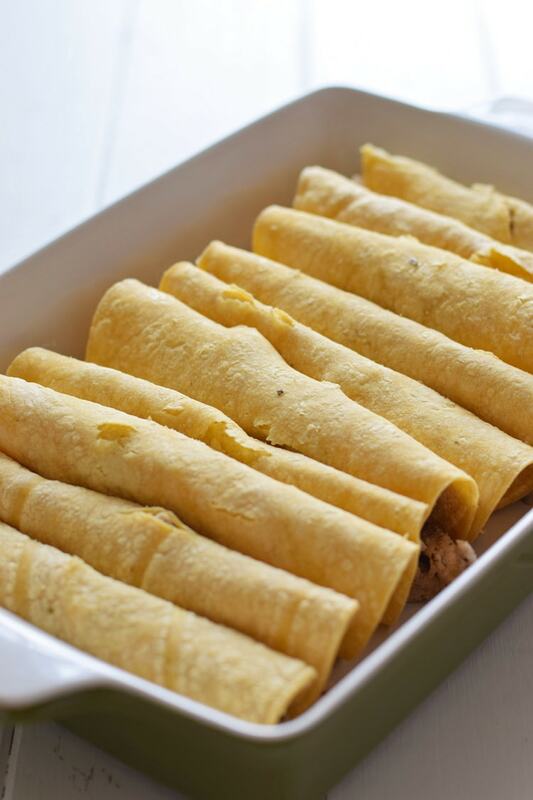 Enchiladas are easily one of the most popular Mexican dishes in my house. Granted, my house consists of only the fiancé and I (and Charlie the Cat), but that’s besides the point. 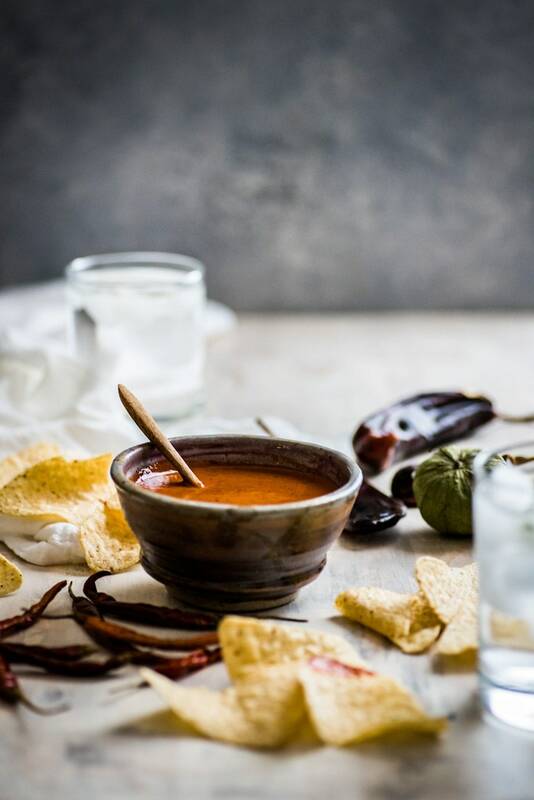 Though there are many variations involving the filling, the cheese, the tortillas, the toppings and the spice/heat level, the one thing that sets enchiladas apart from your regular old taco or burrito is that it’s covered, or in my case, smothered in a chili pepper sauce. 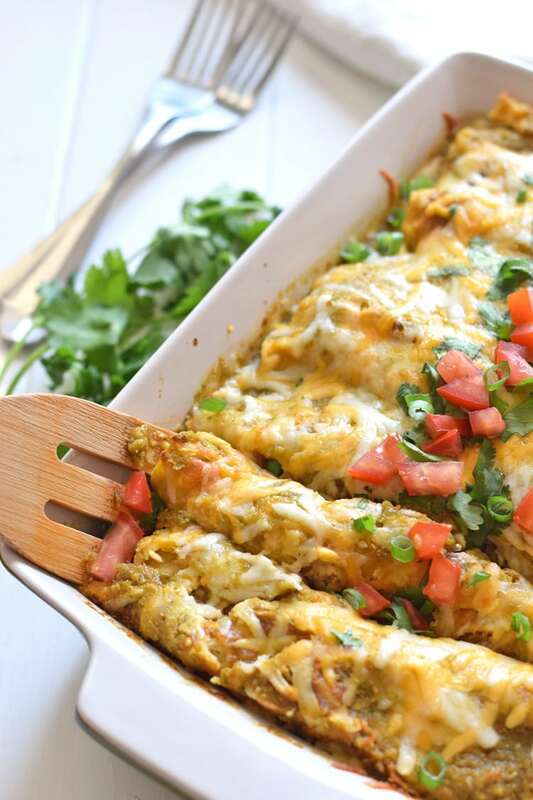 If you like enchiladas with lots of sauce, these Salsa Verde Chicken Enchilada won’t disappoint. 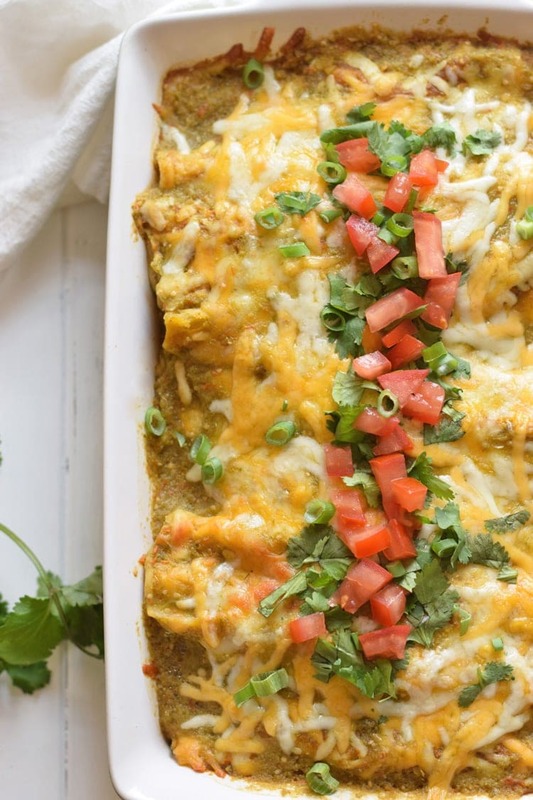 Covered in an easy Homemade Tomatillo Salsa Verde, these Mexican baked enchiladas are great for dinner and make tasty leftovers that everyone will be excited to eat. That is if you end up with any leftovers. 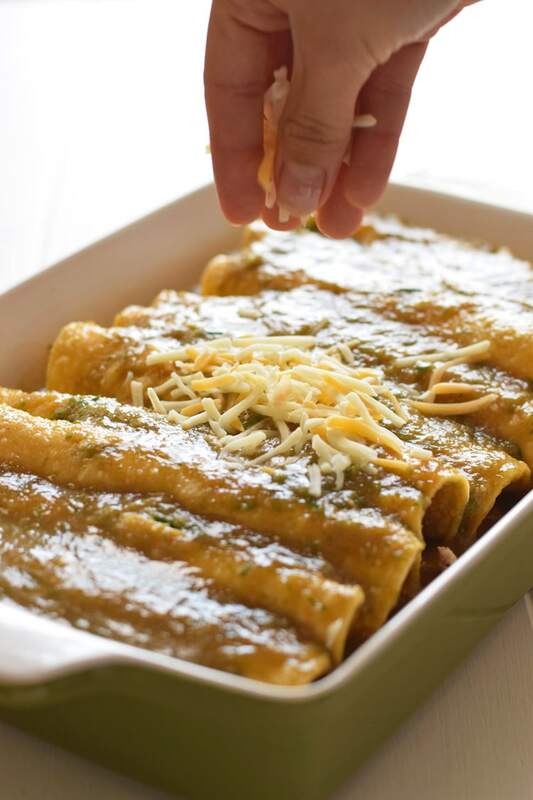 If you’ve never made your own enchiladas before, here’s what you’ll need. 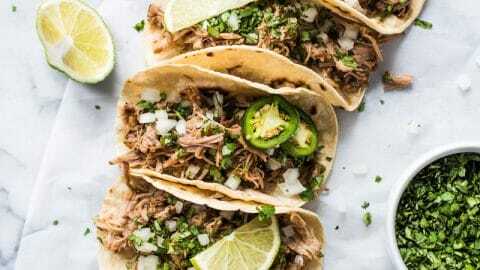 Tortillas – I used store-bought Mission yellow corn tortillas, but if you’re up for it, you can make your own using my easy 3-Ingredient Authentic Mexican Corn Tortillas recipe. You can also use store-bought flour tortillas or make your own using my Authentic Mexican Flour Tortillas (White & Whole Wheat Versions) recipe. I’ve got you covered. Salsa Verde – I highly recommend making your own salsa verde. It’s just so easy and versatile, once you make it, you’ll wonder where it’s been your whole life. This recipe uses my easy Easy Salsa Verde recipe but if you’re not up for it, store-bought salsa verde works as well. Cheese – Lots of it! 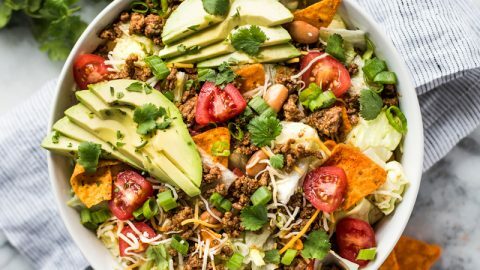 This recipe uses a Mexican shredded cheese blend that includes Monterrey Jack, Cheddar and other cheeses. But if you’ve only got cheddar or mozzarella in your fridge, that works, too. 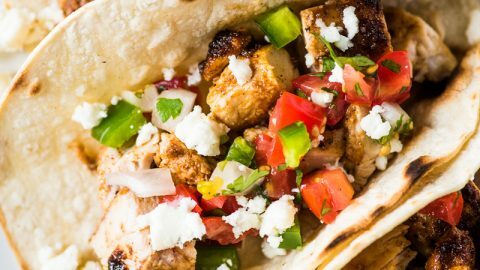 Once you’ve got all your ingredients ready to go, just spoon some chicken into the each tortilla, roll them up into little tacos and place them a baking dish seam side down. 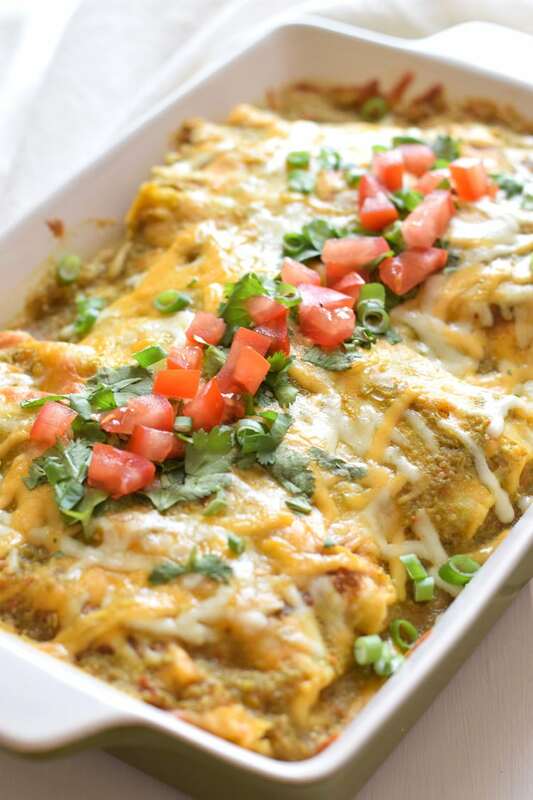 Cover the tortillas with the salsa verde, top with cheese and bake! I normally eat my enchiladas with a side salad and a dollop of sour cream but if it’s a special occasion, I’ll usually serve it with some refried beans and rice. Just like mom makes it. If you’re interested in making a vegetarian version, I recommend stuffing the enchiladas with pinto or black beans, cheese and some chopped spinach. I promise you won’t even miss the meat. In fact, I grew up eating enchiladas stuffed with only cheese. That’s just how my mom made them. It wasn’t until I was older that I realized there were so many other variations that I’d never tried. Though believe me, I’m DEFINITELY not complaining. I love cheese! It’s one of those ingredients that I can’t help but eat when I’m preparing a recipe that uses it. Shredded cheese straight from the bag. It’s amazing. Slice chicken breast or thighs into thin strips. In a medium bowl, combine chicken, olive oil, cumin, oregano, onion powder, sea salt and lime juice. Place seasoned chicken onto a large baking sheet and bake in oven for 10 to 12 minutes. Warm corn tortillas in the microwave for 30 seconds to soften them. In a 2-quart baking dish, begin to assemble the enchiladas. 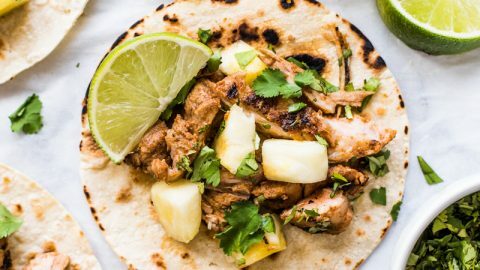 Spoon some of the baked chicken into a warm tortilla. Roll up like a taquito and place in baking dish, seam side down. Continue until all tortillas have been filled. Pour the salsa verde evenly on top of the enchiladas. Top with shredded cheese. Serve with diced tomatoes, cilantro and green onions. 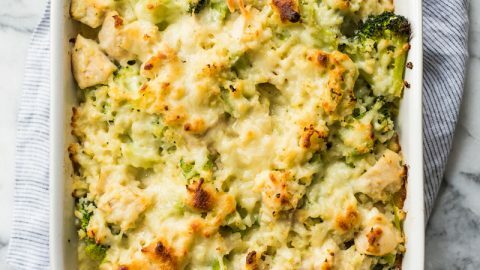 To save time: use any leftover shredded chicken you have in the fridge or use a store-bought rotisserie chicken and shred it at home instead of baking your own. Season the shredded chicken as instructed in the recipe. 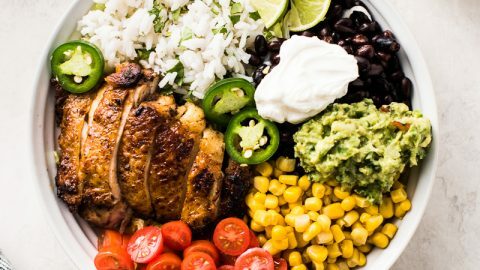 This turned out to be one of my favorite meals to not only make, but to eat. It was easy but the finished product looked and tasted like it was from a restaurant. I added cotija cheese as well on the top of the enchiladas. Served with Spanish rice and black beans. It rocked! 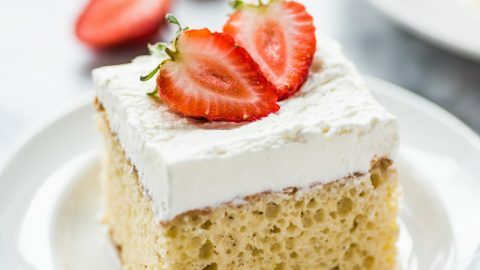 I found this recipe on Pinterest about a year ago and have made it at least 4 times. We had it again tonight for dinner. I go the easy route and use store bought salsa verde, and use red onion instead of green, use flour instead of corn tortillas (can never find corn!!) but it is SO good. One of my favorite dishes to make. WhollyGuacamole spicy goes so well with it, too! 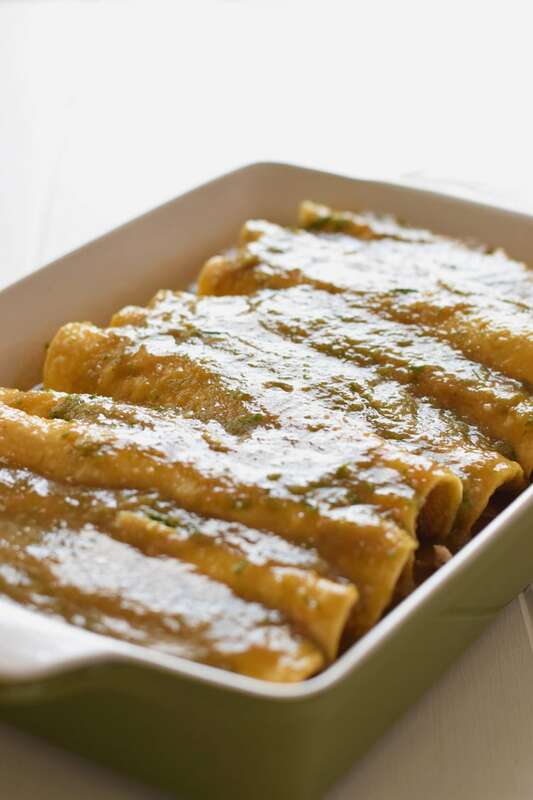 Shouldn’t the tortillas be dipped in the salsa verde before they are filled and rolled? That is how I was always taught to make enchiladas. 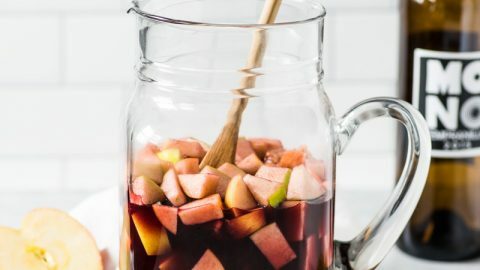 Regardless, I look forward to trying this recipe. Thanks! Hi Blayne, yes! My parents did the same thing! They also fried the tortillas though, and since I’m not frying them, I decided to just pour the sauce on top. You can dip them in the salsa instead if you prefer. Thanks – I hope you like them! What are the measurements of salsa verde I’m suppposed to use? I used about 2 1/2 cups of salsa verde. 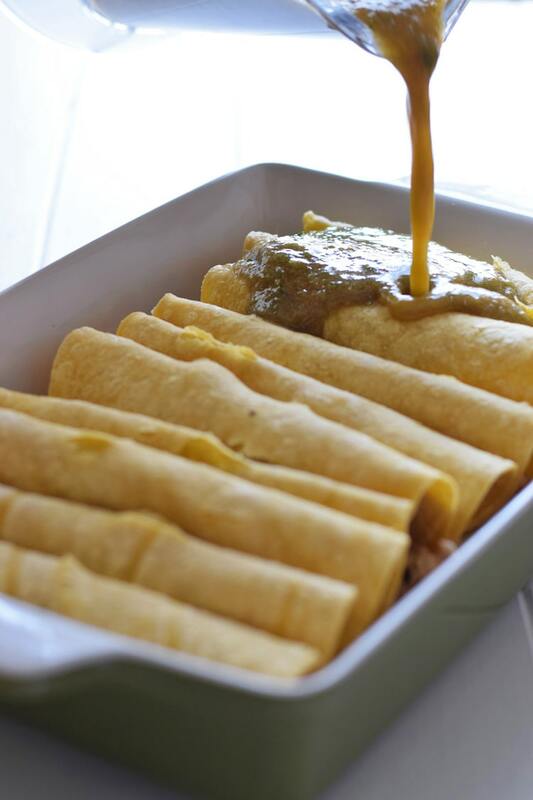 You can use more or less depending on whether you prefer your enchiladas very wet with sauce or not. Made this last night and my adult daughter just raved about it. I thought it was good as well. Made some adjustments due to ingredients I had on hand. Used flour tortillas, medium-spiced salsa verde in a jar, shredded cheddar cheese, and left over taco shredded chicken. Absolutely yummy. I made this recipe. Absolutely delicious! The last time I made enchiladas, almost like your directions (minus the seasoned chicken),…they came out soggy. Did you not have this problem? 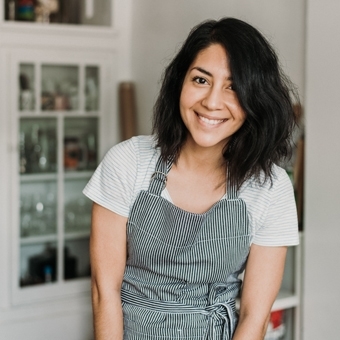 Hi Briana, the enchiladas are topped with a lot of salsa verde so it does tend to make the corn tortillas soft, but that’s actually how I like them. You could try to use 1/2 or 3/4 of the sauce next time and that should solve that problem. This was yummy! I also added black beans when rolling the tortillas, then put the rest of the black beans over the top before the cheese. Will definately make again!